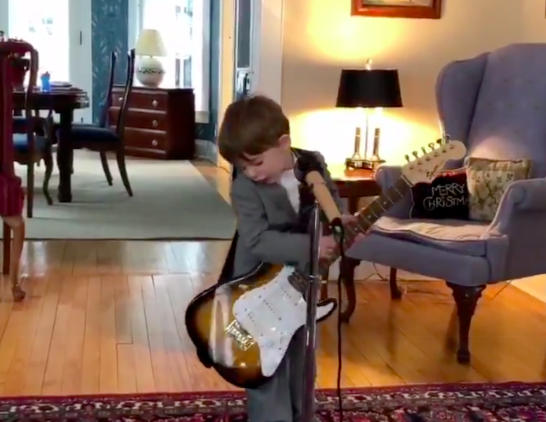 This adorable videos hows a little kid who got exactly what he wanted for Christmas: David Byrne’s suit, an electric guitar and a mic. You see, the kid is a massive Talking Heads fan, and at only three years old, he wanted nothing more than to recreate the “Stop Making Sense” concert. The adorable video above shows the kid singing “Burning Down the House”. It’s adorable, and we know only one thing — this kind is going to be one of the most absolute cool kids on the planet. Twitter responded positively to both he kid and is absolute infinite sense of cool. One Twitter user even uploaded a video of HER three year old nephew, who adores Kurt Cobain, and can be seen in the video below trying to play along to one of his song. David Byrne, Kurt Cobain — I’m glad for just one thing. These toddlers have exactly the same taste as me at age thirty. Bring the me Regina Spektor child, I beg of you! What do you think of the adorable videos? Let us know in the comments or n Twitter at @WhatsTrendng.